QUEZON CITY – Dismissed workers of DBSN Agriventures – a poultry dressing plant in Albuera, Leyte, that has a production capacity of 65,000 heads per day and a supplier of food giants San Miguel Foods Corporation and Jollibee Food Corporation – staged a picket in front of the head offices of said food conglomerates in Ortigas Center Wednesday to highlight their sorry plight. 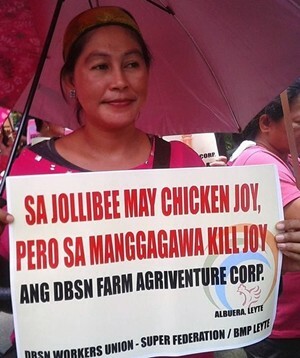 Josephine Jaballa, spokesperson of the DBSN Agriventures Workers Union said, “We appeal to San Miguel Foods Corporation and Jollibee Food Corporation to look into the workplace conditions of their contractors, subcontractors and suppliers, particularly DBSN Agriventures that supplies their chicken meat requirements”. DBSN Agriventures is one of the biggest poultry dressing plants in the country. It was accredited by the National Meat Inspection Service and certified as an ISO company by TUV-Rhineland despite its violations to labor standards. Workers at DBSN Agriventures are paid for P285 per 15-hour shift, which is but the regional minimum wage for workers in Region 8 for 8-hours of work, without overtime pay and premium among its many labor standard violation. DBSN Farm Agriventures Corporation is owned by Ramon Oñate, Municipal Mayor of Palompon, Leyte. “SMC Foods and JFC should recognize the reputational risks brought by sweatshop labor to their popular brands. If they want to, both companies, who major industry leaders, could easily put pressure on their suppliers and contractors to comply with labor rights and standards before they could enter into business with them,” she added. “If not, then we have every reason to declare that the multi-billion peso empires of San Miguel Foods and Jollibee Food Corporation were accumulated through the gross violations to labor standards, severe capitalist abuse and exploitation, and subhuman working conditions of its contractual workers,” she explained. Despite working for more than a year and performing functions directly related to the principal, the DBSN Agriventures management forced its employees to sign a contract, under threat of termination, to make them employees of JBC or Manpower Services, an agency which engages in the prohibited practice of labor-only-contracting. The said manpower agency is owned by the daughter of the plant manager. Upon the inspection of a labor inspector of DOLE Region 8, DBSN was found guilty of the following labor standards violations: (1) No proof of coverage/remittance of SSS, (2) No Service Agreement, (3) Non-payment of Overtime Premium Pay, (4) Non-payment of Service Incentives Leave Pay, (5) Non-payment of Holiday Pay, (6) Illegal deduction (personal protective equipment such as masks, gloves, and aprons, and delivery and transport expenses of sold products by boat), (7) Non-payment of Night Shift Differential Pay, 8. Non-presentation of D.O 174 Registration Certificate, (8) Non-payment of 13th Month Pay. The DBSN workers are currently holding a camp-out infront of the Intramuros offices of the labor department. They are demanding their reinstatement as regular employees and the implementation of labor standards as defined by the Labor Code. The workers are being assisted by the militant Bukluran ng Manggagawang Pilipino (BMP). BMP president Luke Espiritu concluded, “The DBSN workers have travelled by land, risking life and limb, to hold a campout outside the labor department. It is a desperate act brought by subhuman conditions. They are not only up against supplier/contractor that is connected with the food oligarchs. They are also fighting an employer who is also provincial warlord with no regard for human rights. Their plight emphasizes the futility of Executive Order 51, which was signed by Duterte last Labor Day”. Alfredo L. Bollido (center), Assistant District Engineer of Biliran District Engineering Office holds a meeting for contractors together with Section Chiefs and Technical personnel on July 4, 2018 at Biliran District Engineering office to address delayed projects of the district. NAVAL, Biliran – “Fastracking our projects doesn’t mean that we need to sacrifice the quality of our work, even if we are ordered to accelerate our accomplishment,” Alfredo L. Bollido, Assistant District Engineer reiterated to contractors. Bollido holds a contractor’s meeting on July 4, 2018 at Biliran District Engineering Office (BDEO) to address problem on delayed projects of the district office. 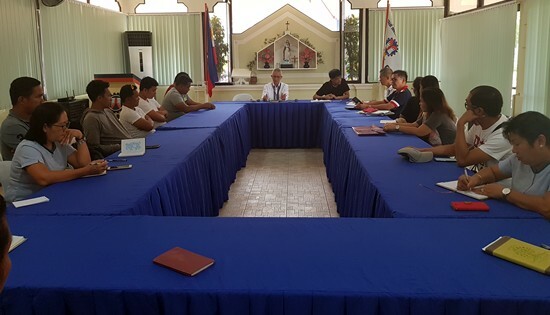 The meeting was called as directed by District Engineer David P. Adongay Jr. who was attending a very important meeting at the DPWH Central Office at that time. “Those contractors who have already 50%-100% negative slippage will be recommended for contract termination and will be automatically blacklisted to participate in any future biddings in Biliran DEO,” Bollido said. Under 2017 project implementation, out of the 57 projects, BDEO has completed 52 with still five projects on-going which are being rushed for completion. QUEZON CITY – The Trade Union Congress of the Philippines (TUCP) is calling for an in-depth cleansing of the entire Philippine National Police (PNP) organization from hoodlums in uniform that could have infiltrated the organization as evidenced by police involvement in assassinations, killings, kidnapping-for-ransom of civilians and violent breakup of workers’ lawful picket across the country. TUCP President Raymond Mendoza expressed grave concern over the failed police assassination Monday morning on labor leader and TUCP Vice President and barangay councilor Jessielou Cadungog Monday morning in Tejero, Cebu City. The gunman who was killed in trying to assassinate Cadungog was identified as PO2 Eugene Alcain Calumba. The accomplice who was taken in custody was PO2 Michael Banua. Mendoza also condemned the police brutally in breaking up workers of NurtiAsia who were holding a lawful picket outside the factory in Meycauayan, Bulacan Monday for illegal contractualization, substandard payment of wages, non-payment of mandatory social protection insurance committed by the management. “Who will protect us now against lawlessness and breakdown of the rule of law now that the police themselves who are supposed to protect the people are the ones who are killing and hurting us? Who will protect us now that the police themselves are kidnapping us? Where do the weak and powerless go and seek for protection? Mendoza said. “The recent spate of police involvement in criminal activities directed at civilians and ordinary citizens merits an honest-to-goodness cleansing of the police ranks nationwide to separate the bad ones from the good ones so that the people’s trust in our PNP is restored,” Mendoza said. Cadungog is a long-time labor leader in Cebu who helped organized the port workers union against the abusive labor slavery and played a key role in port workers establishment of the Oriental Port and Allied Services Corporation (OPASCOR), a company providing arrastre and stevedoring services in the Cebu International Port. The workers’ enterprise is owned by workers affiliated with the TUCP’s Associated Labor Unions-Trade Union Congress of the Philippines (ALU-TUCP). Rather than initiating an investigation into the incident, Mendoza lamented by saying the said police assassin’s ranking superiors are passing it off outright as a legitimate police operation and are covering up the incident by turning the tables against Cadungog by claiming it was the victims who were trying to kill the motorcycle-riding police assassins. According to Mendoza, the policemen’s botched attempt on Cadungog sent a chilling effect on the labor movement with the PNP acting as the judge, the jury and the executioner. The incident will now surely hamper trade unions’ efforts to organize workers for better wages and benefits, good working conditions and affect labor groups’ efforts to safeguard workers from abusive employers and business owners, Mendoza said. TUCP called for an independent investigation by the National Bureau of Investigation (NBI) into the failed Cadungog ambush. Mendoza also cited the case of previous police assault on union leader Patricio Tago Jr, 33 years old and vice president of De Luxe Bags Philippines Inc. Employees Union while organizing workers in Tarlac City. On September 25, 2016, Tarlac City policemen also abducted Tago at gunpoint and imprisoned him on trumped up illegal drug charges to dissuade 3,000 other co-workers to vote against forming a union. 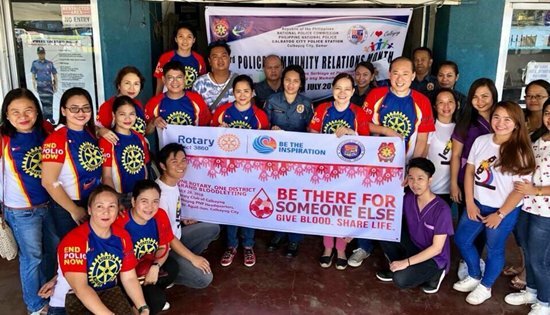 CALBAYOG CITY – “To err is human but to save life is heroic.” The Rotary Club of Calbayog delivers one heroic deed to the community by implementing its Health Service Program in a bloodletting activity held Saturday, July 28, at the Calbayog City Police Station, Brgy. Aguit-itan, this City. The activity is in line with the One Rotary, One District Grand Bloodletting bannered, “Be there for someone else. Give Blood. Share Life.”, by the Rotary International District 3860. This initiative promotes community empowerment by educating the participants the benefits of blood donation as it reduces cancer risk, boosts the production of red blood cells, beneficial for the human heart, lowers cholesterol level, replenishes blood, aids in fighting hemochromatosis, facilitates production of red blood cells, makes the donor psychologically rejuvenated, and donors are automatically warned of serious illnesses urging them to seek for medical help or assistance. 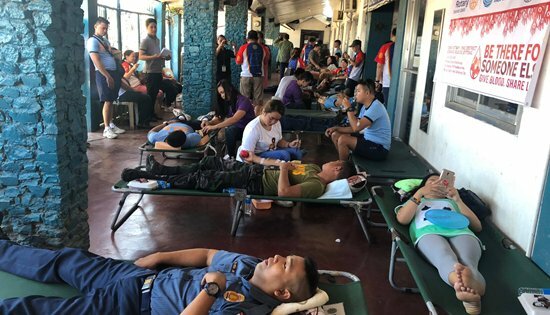 Different government agencies and civic organizations joined the said activity yielding 37 blood bags out of 60 would-be donors after undergoing medical screening. The vast support of the Philippine National Police (PNP) headed by Provincial Director Nicolas Torre III resulted to the participation of police officers from different police stations in Samar including San Jose, Happy Valley, Tarangnan, Palanas Cara, Sta. Margarita, San Joaquin, and Calbayog City. Some donors came from the Department of Education, Bureau of Fire Protection, and three Lady Rotarians of RC Calbayog. “I earnestly request all Calbayognons to support the advocacy of RC Calbayog because of the scarcity of blood in the locality”, said Mr. Aris P. Dacaynos, team leader, Blood Bank, Provincial Government of Samar. “Calbayog City alone consumes about 100 blood bags every month. That’s why we encourage more blood donors that will save more lives especially the less privileged.” Dacaynos added. RC Calbayog plans to conduct the bloodletting activity on a semi-annual basis enjoining the participation of the 157 barangays of Calbayog City through its barangay officials to encourage more blood donors and to make the blood available to the hospitals in the city for emergency use of the less fortunate patients. Mr. Andrew D. Soledad, NMP Head of the Information and Marketing Section answers questions from PESO Manager of NWSSU regarding NMP’s programs and services. 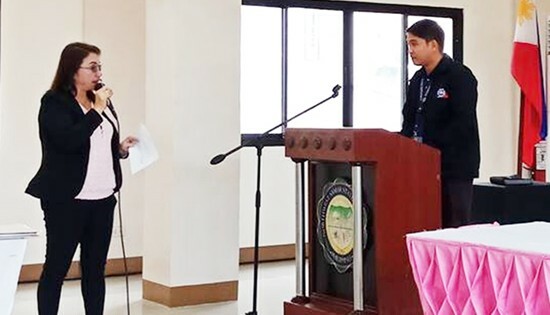 TACLOBAN CITY – As part of the Agency’s information and dissemination drive, the National Maritime Polytechnic (NMP), a premier government-owned maritime training and research institution attended the 2nd and 3rd Quarter Public Employment Service Office (PESO) Managers Conference last 26 July 2018 at the Northwest Samar State University (NWSSU), Calbayog City, Samar Province. The event was organized by the Department of Labor and Employment (DOLE) Samar Field Office in order to discuss issues and concerns in the implementation of PESO programs for the previous quarter and to have strategic planning for the current and future implementations. In line with the Agency’s effort of strengthening its visibility especially within the region, NMP took the opportunity in marketing its training courses and services during the said activity. Agency fact sheets and prints of Annual Master Training Schedule (AMTS) were distributed to the PESO Managers. Also highlighted during the NMP’s presentation was the offering of Basic Training for Motorboat Handlers /Fisherman Operators (MBHOF) under its modified safety courses, which form part of the Agency’s corporate social responsibility. MBHOF is being conducted by NMP for FREE in partnership with the Philippine Coast Guard (PCG) and the Maritime Industry Authority (MARINA) Regional Office VIII. PESO is a non-fee charging multi-employment service facility or entity established or accredited pursuant to Republic Act No. 8759 otherwise known as PESO Act of 1999 aimed to carry out full employment and equality of employment opportunities to all to strengthen and expand the existing employment facilitation service machinery of the government particularly at the local levels. Those interested in NMP research undertakings may visit the NMP website (www.nm.gov.ph) and access the e-Research Information System Portal which is designed for gathering inputs for NMP’s research, dissemination of NMP completed researches and other articles pertaining to maritime research. QUEZON CITY – The country's biggest labor group Associated Labor Unions-Trade Union Congress of the Philippines (ALU-TUCP) revealed that the "more than 300,000 regularized endo workers" by the Department of Labor and Employment (DOLE) as its accomplishment since 2016 is grossly exaggerated. DOLE Secretary Silvestre Bello and Bureau of Labor Relations Director Benjo Benavidez made it appear to President Duterte for his State of the Nation Address Monday that the DOLE have regularized 321,000 Endo and contractualized workers over the period of two years as achievement in compliance to Duterte efforts to stem the prevalent, short-term and temporary contractualization work practice. However, upon verification of the records of DOLE Thursday, ALU-TUCP Spokesperson Alan Tanjusay learned that only 202,000 contractualized workers have been absorbed voluntarily by different establishments nationwide as regular workers and about 119,000 other Endo workers have yet to be regularized because the principal employers are contesting the regularization order of DOLE regional offices. Even the 202,000 alleged regularized Endo workers are still questionable because it has to be verified if they were regular to the middlemen manpower agencies or to the principal employer and principal business owner that utilize their service. We urge the DOLE to rectify the matter and make the necessary, accurate and honest clarification to the people, Tanjusay said. It can be recalled that Bello vehemently denied ALU-TUCP allegations they misinformed the President with the data and dared Tanjusay to himself check his data with the DOLE office. But Bello surprised with Tanjusay showing up his office the whole day Wednesday. Instead of facing Tanjusay, Bello rather asked Benavidez and Undersecretary Joel Maglunsod to talk to the ALU-TUCP spokesperson. QUEZON CITY – Teachers group Alliance of Concerned Teachers Philippines called on the Department of Education and the Congress to do ‘an honest evaluation of the whole K-12 program and see that it is better abandoned altogether than be maintained or reformed.’ ACT issued the statement after DepEd Secretary Leonor Briones announced that the K to 12 curriculum will undergo review to ‘keep up with the changing times’ last July 26. “K to 12 has worsened the problems of our education system in all aspects. Its impetuous implementation has aggravated the shortages in facilities, personnel and materials. It intensified the privatization in the basic education through the voucher system. It reinforced the colonial and market-oriented curriculum of the basic and tertiary education. We can see no reason why it should still be continued,” said Raymond Basilio, Secretary General of ACT Philippines. Republic Act 10533 which was passed in 2013 made mandatory the one year in kindergarten and two years in senior highschool purportedly to address the poor quality of basic education and high unemployment rate. “And for what?” asked Basilio, noting there is no remarkable improvements in the achievement test results of K to 12 students nor in the country’s unemployment rate. He cited that the Philippine Chamber of Commerce and Industry (PCCI) said in a statement early this year that the 1st batch of K to 12 graduates were not ready for skilled jobs and are therefore not employable. Basilio agreed that the current K to 12 curriculum is problematic. “Not only does it serve capitalist interest, it also promotes an even more colonial education. For one, Philippine History is no longer taught in highschool. It also effected the reduction of required Filipino and social science subjects in the tertiary level,” he noted. He, however, criticized Briones’ K to 12 curriculum review direction of ‘teaching how to make robots’ and ‘teaching life skills,’ saying that it does not get out of the colonial framework of producing cheap labor to meet global market demands and reinforces individualistic desire for wealth and success. “Education must be geared towards national development. Its duty is to optimize the potentials of our youth and instill among them a deep desire to serve the country. They should be equipped with critical thinking, necessary skills and sense of nationalism to enable them to analyze and help solve the underdevelopment of our country. “It is not enough that they are taught how to ‘adapt to the fast changing world.’ They should be made to realize that they can be catalysts of change and that they must use their skills and talents in effecting the kind of change that the Filipino people aspire – to be freed from poverty, underdevelopment, corruption in government and dependence to foreign powers,” Basilio concluded.